An argumentative essay is a critical piece of writing which deals in getting out all the details and tells a student to do all the research and investigate the information whether to be true or false and write the essay in a correct manner with all the precise facts in it. In argumentative essay, the writer argues or expresses his point of view with certain proofs and facts to support his argument. The main idea of argumentative essay is to provide with an option whether positive or negative implications. It helps in grabbing attention of readers and create an impact that the reader starts thinking about your point of view. Argumentative essay can also be started with facts, figures and statistics or with quotes. In order to write an argumentative essay, the writer needs to do a lot of research and make sure that the research he has done is correct and authentic. It should be kept in mind that he should find a topic that has two different topic conclusions in the end. This helps in providing with two sides of a story. You can take help from our urgenthomework online tutors. You can contact them anytime of the day or night you want. You will get all the available help to make the topic simpler. Further on argumentative essay, you should be able to explain why your belief is reasonable and correct. While writing the essay, research and find out all you can about both sides of the topic you’ve chosen and then pick a side carefully and research and find out more about it and bring out all the things you can find about that which you can use to argue and use as a defense. Best is to make a list about the things that the writer should use in his essay. One thing you should do is first to present both the sides to explain as to why you support one of the topic. Then tell everything and make it convincing with all the details you have put in the essay. You can be asked questions about your writing by teachers, students and other listeners and you have to answer them properly using your points. You should be able to convince that your side of the topic is correct and the other one’s topic is wrong. So, after assessing both the sides, and providing strong arguments for your logic, finally you should conclude that why your side is correct. A clear, concise, and defined thesis statement occurring in the first paragraph of the essay. In the first paragraph of an argument essay, students should just go through all the details they could about the topic. Next, the student should explain why the topic is important or why readers should care about the issue. Lastly, students should present the thesis. It is essential that this thesis statement be appropriately narrowed to follow the guidelines set forth in the assignment. The student should have a clear cut thought of what he/she wants to write. If the student is not sure about the topic that is going to be written, then it will become difficult to write a proper and persuasive argumentative essay. Transitions are the cornerstone that hold the essay together. Without logical progression of thought, the reader is unable to follow the essay’s argument, and the structure will collapse. Transitions should wrap up the idea from the previous section and introduce the idea that is to follow in the next section. Each paragraph should be limited to the discussion of one general idea. This will allow for clarity and direction throughout the essay. In addition, such conciseness creates an ease of readability for one’s audience. It is important to note that each paragraph in the body of the essay must have some logical connection to the thesis statement in the opening paragraph. Some paragraphs will directly support the thesis statement with evidence collected during research. It is also important to explain how and why the evidence supports the thesis. However, argumentative essays should also consider and explain differing points of view regarding the topic. Depending on the length of the assignment, students should dedicate one or two paragraphs of an argumentative essay to discussing conflicting opinions on the topic. Rather than explaining how these differing opinions are wrong outright. Students should leave the topic on to the hands of the readers or listeners. The argumentative essay requires well-researched, accurate, detailed, and current information to support the thesis statement and consider other points of view. Some factual, logical, statistical evidence should support the thesis. However, students must consider multiple points of view when collecting evidence. As noted in the paragraph above, a successful and well-covered argumentative essay will also discuss opinions not aligning with the thesis. It is unethical to exclude evidence that may not support the thesis. It is not the student’s job to point out how other positions are wrong outright, but rather to explain how other positions may not be well informed or up to date on the topic. It is at this point of the essay that students may begin to struggle. This is the portion of the essay that will leave the most immediate impression on the mind of the reader. Therefore, it must be effective and logical. Do not introduce any new information into the conclusion; rather, synthesize the information presented in the body of the essay. Restate why the topic is important, review the main points, and review your thesis. You can also include more of your research on your topic. Now, as argumentative essays do require long research and authentic information. It leads to a big mess for the students for they have to search a lot and then end up confused. We at urgenthomework.com work at helping you in an organized manner. For further help, please visit our website. Our online teachers from urgenthomework.com will help you with your homework as much as possible and guide you throughout your home assignments. Argumentative essays are very difficult as in it, you have to show both sides of the story. It must be kept in mind that you cannot neglect one side of the story entirely. It is important that you leave it to the audience or readers to decide as to which side they want to choose. 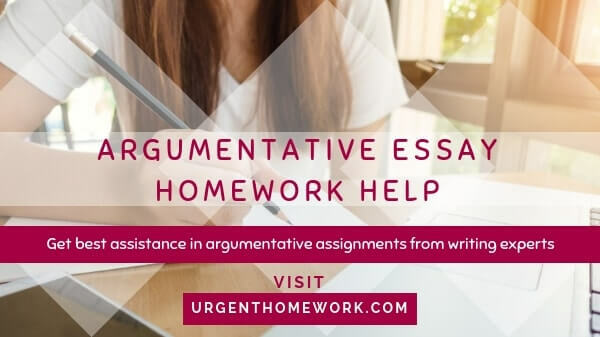 If you need any other assistance regarding the argumentative assignments, then visit our site and our teachers would be very much thankful to provide you with help. We are available to you anytime and we will try everything in our power to make you understand the topic and help you write a good argumentative essay. Is Your Generation Really Post-racial?